Experience the culture of aloha from this 'Hale Ho'okipa-House of Hospitality,' a 1-bedroom, 1-bath vacation rental apartment in Keaau. Sitting on a 1-acre lot, this home for 4 offers travelers an authentic Hawaiian experience far from resorts. Whether you spend your days snorkeling or whale watching, you'll love ending each day at this island getaway. As you arrive at this 1-acre paradise, you'll be floored by the beauty of tropical flowers, fruit trees, herb garden, and vegetables that call this slice of heaven home. When you need a break from the island heat, retreat into the great room and melt into the plush couch. Complete with a flat-screen cable TV, ceiling fan, and large glass doors, the great room is both comfortable and elegant. The spacious bedroom has air conditioning. No matter what you choose to whip up in the fully equipped kitchen, it's sure to taste delicious when shared with loved ones at the dining table for 4. Not quite ready for bed? Head onto the furnished lanai and experience the beauty of the Hawaiian star speckled sky or take a night dip in the pool. The large bedroom, complete with a queen bed and large windows, is the perfect place to rest your head after a day at the beach. Grab the complimentary beach toys and head 30 minutes down the road to the black sand beaches of Hilo! With opportunities to swim, surf, and turtle watch, Hilo has something for everyone. You'll also be a short hour and a half drive to the leeward side of the island's finest white sand beaches during your stay. When you don't feel like cooking, head less than 10 minutes down the road to one of Pahoa or Keaau's delicious eateries. Boasting everything from simple Hawaiian fare to various ethnic cuisines, these small island towns are sure to have something to quench your cravings. Kaleo's, located in Pahoa, has great local eating with live music. Don't miss Rainbow Falls or the botanical gardens in Hilo an easy 25-minute drive away. In the winter, you have the chance of seeing whales from the coast a 10-minute drive away. Take a stroll on the beach cliff walk for a relaxing afternoon. - Amenities include a fully equipped kitchen, blender, flat-screen cable TV, air-conditioned bedroom, furnished porch, shared deck, shared pool, 1-acre landscaped yard, a shared laundry facility, beach toys, snorkel gear, boogie board, free WiFi, carport parking for 1 vehicle, driveway parking to 1 vehicle, and more! - Unbeatable Keaau Location - 30 minutes from Hilo's black sand beaches and within 10 minutes of delicious dining! Nice and spacious bedroom. Very responsive owner. The shower hot water knob was broken when we try to use it the first time. It is Christmas! And the owner responded immediately and we used the bath upstairs that night. And the issue fixed the next morning! Only thing we are not quite satisfied is the bath room space, there is no room to put you toiletries and skin care stuff. Generally a great place to stay. We Highly Highly Recommend Susie's & Lester's Hawaiian apartment!! The unit had everything that we needed plus more as the photos do not do display the BEAUTY & PEACE of the gorgeous wooden deck right out the door of the unit! This was our favorite place every morning to hang out & enjoy coffee & read. The owners are incredible hosts & greeted us warmly with homemade Delicious scones when we checked in. They have done a great job in maintaining the unit as it was neat & tidy and found all we needed at this very special place. Also this location is ideal because the Volcano park is near & all you could need is right down the road: restaurants, groceries, pharmacy, coffee store, & more. We cannot wait to come back to this lovely place as we truly felt the Aloha spirit here! 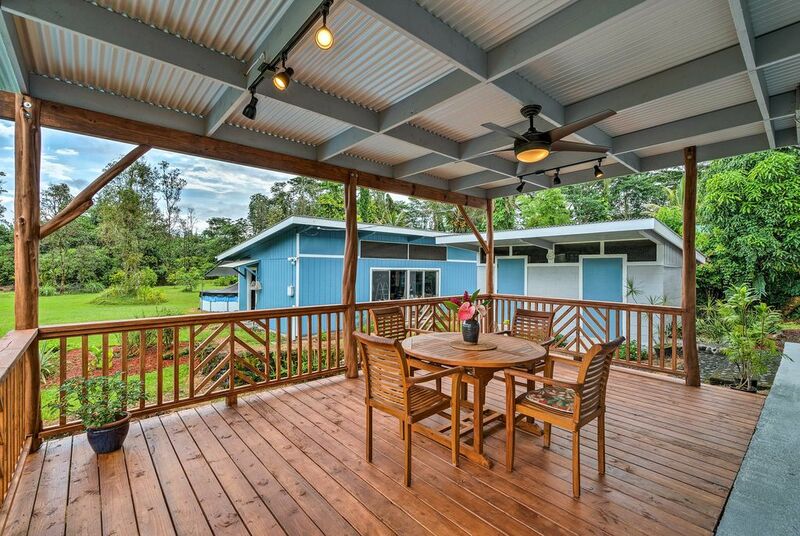 This is a perfect place for a small group of friends or family to stay near Hilo. It's inviting, sunny, comfortable, clean, and air-conditioned with all the amenities you need. Our kids played in the pool for hours while we relaxed on the beautiful wooden Lanai (deck). The deck is new and not pictured in some of the photos, but it is one of the best features of the house. It's a great place for families to lounge, eat, play music and enjoy the natural beauty of the owners spacious Hawaiian garden. Great stay! Took a chance and so glad we did. This property had just entered the market, it so had no reviews. Since the pictures were great, as is the price, we went for it. Stayed for 5 nights, and can say with certainty, the place is great! The gracious hosts, Susie and Les, are amazing. They made our stay special, with great advice, yummy treats, and toys for the kiddo. They are the owners of the property and live upstairs from this in-law-style apartment. Both were both friendly and inviting, yet respectful of our privacy. This rental has a private entrance, and covered parking. The grounds are well kept and spacious with fruit trees, an herb garden, and some lava scattered about. The place itself is well outfitted, and very clean. The kitchen has many nice surprises, such as a rice cooker, cast iron pan, a blender, spices plus all the stuff you would expect to create a good meal. We really appreciated the quality of the items supplied, a step up from the often thrown-together places one sometimes finds. The furniture is excellent as well: comfy bed, quality dining room table and chairs, large couch. If you have little one like we do, Susie and Les can provide a high-chair, pack-n-play and toys. There are beach and picnic supplies, an excellent washer and dryer, some DVDs and games, as well as. Lots of nice decorative touches, making the time we spent there feel like a home. You’ll need a car if you stay here, which is true for most places on the Big Island. The place is in a quiet neighborhood, and just a short ride to the ocean. It’s an easy drive to Kea’au for groceries/supplies and close to Pāhoa for good eats and funky vibes. It takes about 25 mins to get to Hilo and 35 mins for Volcanoes National Park.